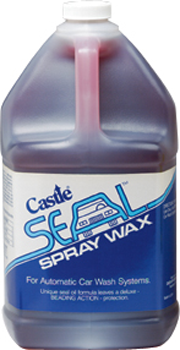 Castle® Seal Spray Wax™ was formulated to give a bright, waxed appearance in the final rinse of automotive or cloth operated car wash systems. It is a highly concentrated liquid that will leave an excellent final finish and cause immediate beading of water. It reduces water spotting on glass, metal, and trim. It helps eliminate the need for hand toweling. Seal Spray Wax™ will not harm painted surfaces and will protect wax finishes. It can be used in automatic systems or hand operation, using foamers, or sprayers. It is safe for use on clear coat finishes. 1. Dilute into final rinse of car wash. The dilution factor is well over 20 cars per gallon. 2. For best results, follow automatic system dilution recommendations. Approximately 5 oz. per 4 gallons of rinse.